Interpreting a pet food label can be tricky; sometimes there is a lot of precise wording that manufacturers play with to market their products and still comply with regulations. Read on to decode some of the pet food label tricks of the trade. Walk through the pet food aisles and you will see a bewildering array of products with a multitude of names. Platters, dinners, entrees, meals, morsels…what does it all mean? Well, first of all, the simpler the title of the pet food, the higher the content of meat. For example, a pet food called ‘Beef Dog Food’ must contain 70 per cent or higher content of beef. If the label reads ‘Beef Dinner (platter, nuggets, entrée, morsels, etc.) for Dogs’ then the manufacturers are only required to include 10 per cent beef. If the label says ‘Dog Food with Beef’ then a mere 4 per cent of beef content is included in the food. If the label reads ‘Beef Flavour’ none of the actual content of the pet food needs to be beef. So for the pets that are carnivorous or omnivorous, this can make a crucial difference in the health of your pet. Cats in particular need meat based protein and their health can suffer when fed too many carbohydrates and not enough protein. When in doubt, check ingredient listings to see if the product in the title is the first ingredient listed. If not, pick another food. Meat is the clean flesh, skin, fat, organs and sinews of an animal and does not include feathers, hooves, hair, horns or teeth. A good quality pet food for carnivores and omnivores should have meat listed as the first ingredient and it should specify from what animal. By-products are anything else off that animal that isn’t considered ‘meat’ and includes bones, heads, feet, unborn fetuses, etc. Meal is meat that has been rendered, which means all the leftovers are put into a vat, boiled, then dried out and ground into a fine powder. While this kills bacteria, parasites and other possible illness causing elements in the meat, the high heat also helps to destroy nutritional elements in the food which means manufacturers have to artificially replace these qualities afterwards. Pet food manufacturers have used the consumer’s love of ‘special’ products for their pets to create a series of niche markets that give pet owners the feeling of catering to the particular needs of their pet’s breed or time of life. In fact, there are only 2 standards recognised by pet food inspectors, growth stage (gestation and lactation) and adult. So a label that reads ’designed for seniors’ is actually just marketing hype, there may be small amounts of glucosamine or other additives in the food in small doses that are considered helpful with joint pain, arthritis, etc. but in too small a quantity to actually do an ageing pet any good. Instead, look for references to feeding trials, which show that pet food manufacturer has tested their product in accordance to strict guidelines. To find out what makes up the bulk of your pet food, look for everything listed BEFORE the first fat you see on the label.Pet foods for meat eaters containing vegetable proteins, cellulose, peanut hulls and corn bran are indicators of poorer quality foods. Contact information for the manufacturer and an information telephone hotline should always be included on the label. The information staff should be able to answer your questions about the ingredients of the pet food as long as they don’t involve proprietary information. BHA is suspected to cause stomach cancer, behavioural changes, hyperactivity, liver damage and fetal abnormalities and metabolic stress. 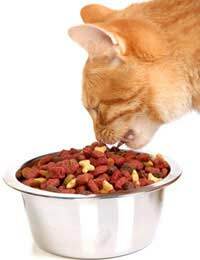 The best guide to a good pet food is to examine your pet’s health. If their eyes are clear, skin and coat is glossy, weight is normal and they have lots of energy, your pet food is probably doing the job.